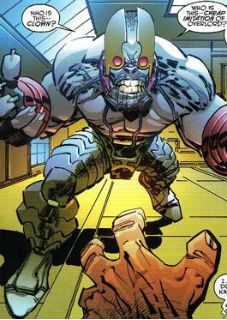 NOTE: Buster Justice created by Erik Larsen, with help by Frank Fosco. After the disappearance of his sibling following an assignment to the Rock House Diner, Buster Justice paid a visit to the diner in search of answers. He led a Vicious Circle contingent onto the premises and interrogated Rock. Nick Justice’s fate was revealed and his carefully preserved body was turned over to his brother. Buster Justice’s forces then fought alongside Rock to fend off an assault by a freak named Niles, leading to Buster agreeing to forget about any past issues. With no leader in place of the Vicious Circle since the death of SkullFace, Buster Justice took advantage and claimed the role. He inducted a large number of new freaks into the villain group’s ranks before initiating a number of high-profile crimes. The increased activity of the Vicious Circle led to the return of Dragon to the Chicago Police Department. Buster Justice’s rule ended abruptly when OverLord III arrived on the scene, killing him to claim his position as leader.